The DMLS chamber has accumulated 18 starts and 152 seconds of firing time. The last test was 31 seconds in duration reached something close to steady state according to the regen coolant temperature measurement. The graph shows the measured temperature of the N2O in the regen coolant jacket near the exit. Notice the temperature actually decreases in the last few seconds of the test, even though the propellant flow rates are constant through out the entire test. Notice also that the N2O is a gas at that temperature. Some of the early tests ended with glowing red sections of the chamber. I think there are several things going on here. 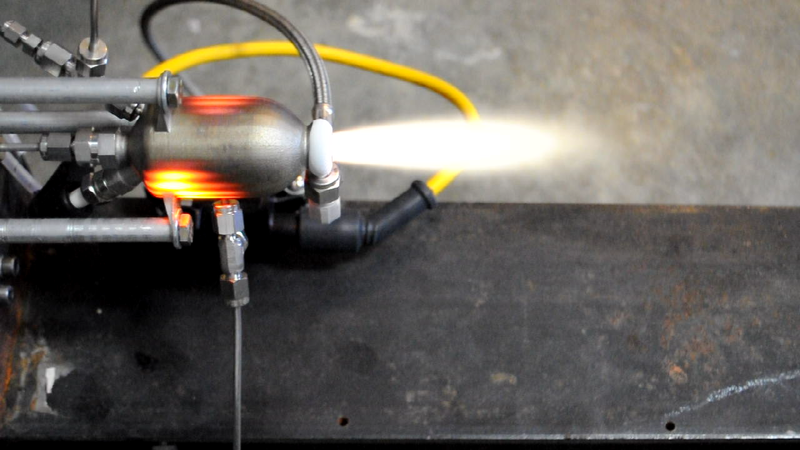 One is that there are some manufacturing flaws in the injector that result in a non-symmetric injection patter, which I think is making locally hotter combustion. Another is that, at low chamber pressure conditions, the regen design is really marginal - I spent most of my time making sure it would work well at the 100% thrust level. I think the main issue is that the channels in the barrel section of the chamber are spaced too far apart. When I first saw the red-hot walls, my first concern was that the N2O was decomposing in the coolant channels. However, based upon the regen temperature measurements this does not seem to be the case. Also, the pictures and video indicate that the hottest wall sections are between channels which is the opposite of what you would expect if the nitrous was decomposing into N2 and O2 at 3000 degrees Fahrenheit. The next tests will be focused on step-wise increasing the chamber pressure to the 100% level and decreasing the O/F ratio. Once I have the operating limits mapped out, I'll decide whether to revise the design, or move to the next step of the project.